Rabbits can devastate a garden. They eat the plants and even the vegetables and leave you with nothing. The only practical way to keep rabbits out of your garden is by fencing them out. Not all fences are rabbit proof, however. 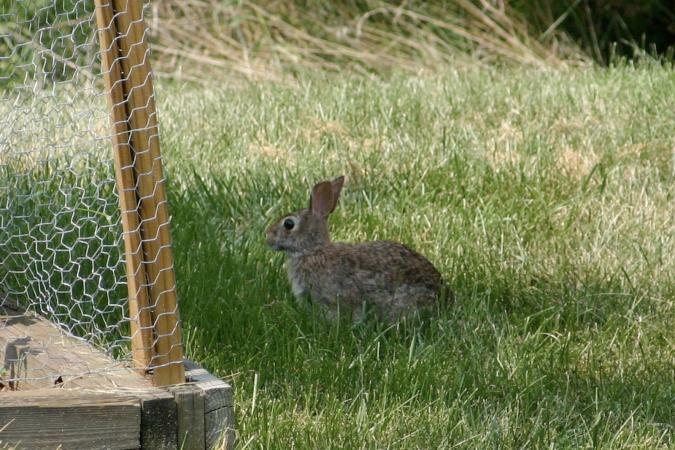 You need to make sure your fence has the several specific qualities to keep out Mr. Cottontail. Small mesh: Most garden fences are wire mesh. Chicken wire works best, as even baby bunnies cannot squeeze through its openings. Buried wire: Rabbits are capable of digging under most fences. It is important to bury your fence at least a foot to prevent rabbits from simply digging under it. The most effective way to bury your fence is to dig a trench about eight inches wide. Lay the wire in the trench forming an L shape with the L facing outward. Then fill in the trench. This L shape is most effective at keeping rabbits from burrowing into your garden. Electrified fence: Putting a "hot wire" or electric fence around the outside base of the fence will shock any creature trying to burrow under or push through it. You need two hot wires, one that is two inches from the ground and one that is four inches from the ground. When the rabbits touch the two wires, it closes a circuit and shocks them. If you use a charger meant for a garden fence, it will not kill the rabbits, simply repel them. Height: Rabbits cannot climb well and cannot jump too high. A fence that is a yard in height is quite adequate to keep rabbits out. Easy Garden Fence EF2001 Rabbit Fence 50 ft Kit - 32 inch H - This kit in a box includes everything you need to build 50 feet of rabbit proof fence. You can buy additional kits and link them to enclose a larger area. The kit includes four poles for the corners, 3' by 50' of rodent proof fencing, 15 ground stakes, 50 self locking ties, drive cap, earth auger and three gate closing hooks. The advantage of this kit is that it contains everything you need to put up 50 feet of fence. The disadvantage is that the fencing is not tall enough to bury a foot of the fence, so rabbits may dig under it. It is priced under $300 for everything. YARDGUARD 28 inch by 50 ft, 16 gauge Rabbit Fence- This green wire is specifically designed to keep rabbits out of the garden, with small mesh squares at the bottom and larger ones at the top. However, it is not tall enough to bury a foot in the ground and still have it be tall enough to keep rabbits from going over it, so they may burrow under it. It costs just over $40. 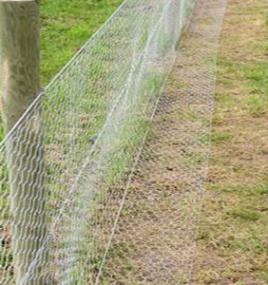 allFenz, 40 inch x 50 ft. Super Rabbit Garden Fence - This vinyl coated wire fence is designed to keep rabbits out of the garden as well. It has small mesh squares at the bottom and larger ones at the top to keep all rabbits out. Again, it is not tall enough to bury a foot in the ground and still have it be tall enough to keep rabbits from going over it, so they may burrow under it. Pick it up for around $30. This is ideal for a large garden space. Purchase chicken wire that is at least 60 inches high. This will ensure the fence is at least 36 inches high when it is finished. 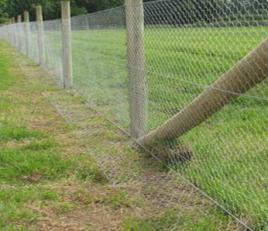 To build a rabbit proof fence, it is necessary to have steel fence posts every ten feet. Any further apart and the wire sags in the middle and the rabbits can get through it. You will need to dig a trench one foot deep and eight inches wide at the bottom of the whole fence. Lay the chicken wire in the trench forming an L shape that faces out toward the outside of the fence. Attach the wire to the poles, pulling it tight. Use five wire clips per post to attach the wire, one at the top, one at the bottom, and the rest evenly distributed between those two clips. Fill in the trench with dirt. For extra security, you may attach two wires, one at two inches and one at four inches from the ground and electrify them with a garden electric fence charger. If rabbits are a problem in a small garden area or you want particular plants to reach a mature level before allowing them to grow unprotected, making portable rabbit proof fence panels do the trick. You can store the panels when not in use and pull them back out when needed. They are relatively simple to make and require a minimum of supplies. You can always make additional panels if the size of your garden grows. Depending on the thickness of the wood strips, nail or staple them together to form a square panel that is 36 x 36 inches. You need at least four panels to secure an area. Wearing gloves so you don't cut your hands and cut the chicken wire into 36 inch x 36 inch pieces using wire cutters. Lay the piece of prepared chicken wire on top of the wood panel and staple it in place. Make sure to pull the wire tight so there are no gaps. Dig a trench around the small garden area you are protecting with the panels that is 6 to 7 inches deep and as wide as the number of panels you are using. Place a panel into the trench and cover with soil, firming it up with your foot so it stays in place. Make sure at least 6 inches of the panel's bottom is covered with soil. Continue until you have all your panels installed around the small garden area. Use flexible wiring and attach to the top, middle, and bottom side portion of two panels, wiring them together so they stay in place. Continue until you have all the panels wired together at the sides. Rabbits are cute, except when they are eating your garden to the ground. Follow these directions and tips, and you can enjoy seeing rabbits without worrying about them eating your vegetables.